Information, knowledge, tips and tricks sharing that might be beneficial or useful to you. It seems that Webe Digital (formerly known as Packet One or P1) had taken a long time to keep on pivoting their mobile service from P1 4G to Webe to Unifi Mobile, until recently, they seems to find some light at the end of the tunnel after the launching of Unifi Mobile #bebas prepaid plan in January 2018. However, this prepaid plan has become less and less attractive. Initially when it was newly launched, it provided each subscribers with up to 5 free SIM cards, in which each SIM card preloaded with free 20GB of LTE data, 10 minutes voice call and 10 SMS. Soon, it changed to provide each subscribers with up to 3 free SIM cards only, and each SIM card preloaded with free 10GB of LTE data, 10 minutes voice call and 10 SMS. Now, it has changed to provide each subscribers with only 1 free SIM card, and the SIM card preloaded with free 10GB of LTE data, 50MB of 3G/LTE data, 10 minutes voice call and 10 SMS. Soon, the SIM card might cost you RM10, and the bundled LTE data might be further reduced to 2GB only. In order to subscribe to this Unifi Mobile #bebas prepaid plan, you will need to download and install the Mobile@Unifi app from Google Play Store or iTune App Store, then order your SIM pack from inside the app. During the SIM ordering process, you can either select a new number or port-in an existing phone number from another telco's existing plan. You can also select to collect your SIM pack for free at your chosen TMpoint outlet, or to have your SIM pack courier to you at the cost of RM10.60. What makes this Unifi Mobile #bebas prepaid plan attractive? You can get a beautiful phone number (or port-in your existing phone number) and start using it without paying a single sen.
You can port out the beautiful phone number to your preferred telco later, to get a better service. If you prefer to stay with the plan, unlike other prepaid plan with fixed weekly or monthly reload commitment, your reload in this plan does not expire. This means your next reload has no time limit, and you can perform the next reload only after you have used up all the existing quota. Anyhow, you need to keep your SIM card active at least once in every 90 days, otherwise your number could be terminated. Unifi Mobile is using its own ex-P1/Webe 4G LTE infrastructure, which has limited coverage, and running on LTE Band 5 (B5, 850MHz band). It is also riding on Celcom 3G and LTE infrastructure to obtain a much wider coverage, which is crucial to provide usable service to its subscribers nationwide. This has made their plan a little bit complicated. Their data usage quota is separated from own Band-5 LTE (listed as LTE only in the subscription options) and Celcom network (listed as 3G/LTE in the subscription options). For 2GB, 4GB and 8GB high speed data top-up, you get 50% of the top-up data for their own Band-5 LTE usage, another 50% for Celcom 3G/LTE usage. If you are connected to their own tower, you consume your data quota under LTE; If you are connected to Celcom tower, you consume your data quota under 3G/LTE. Unlike other telcos which provide free unlimited capped basic data, you need to pay for the basic data in this Unifi Mobile prepaid plan. You can connected to the Basic Data either using 2G/3G or LTE, with a capped maximum speed. Note that beside the ordinary non-expiry data reload options, there are also some unlimited data reload options with expiry (2 hours, 24 hours, 7 days) for you to subscribe whenever you need to consume a lot of data usage during certain specific occasions. The voice call and SMS subscriptions are more straightforward, and both of them are bundled together. 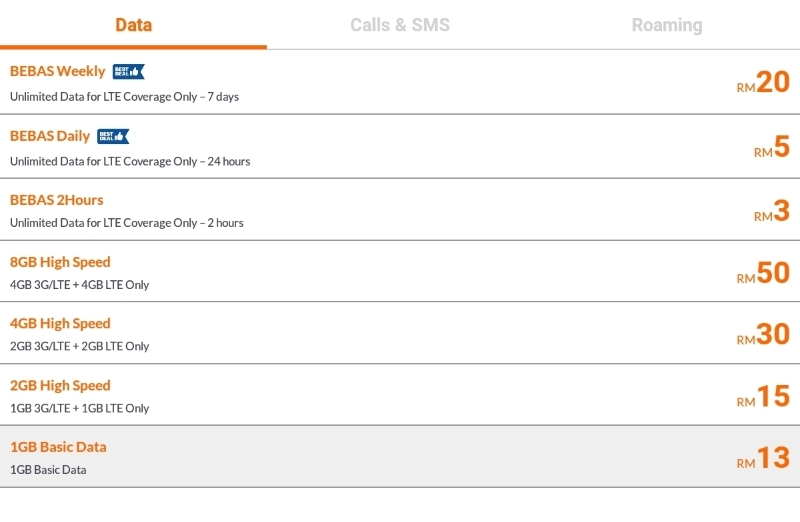 You can consider the SMS as free bundle to the voice call minutes, and each voice call is costed at 15 sen (for 200 minutes) and 16.67 sen (for 60 minutes) respectively. This is considered pretty attractive, because for normal postpaid plans, unused voice call minutes and SMS will be burnt every month, and for normal prepaid plans, you got to keep on top-up every week or every month in order to keep the unused voice call minutes and SMS, or else all the accumulation of them will be burnt in one go. For this Unifi Mobile #bebas prepaid plan, 15 sen per minute is really 15 sen per minute, there is no restriction of when you use it. 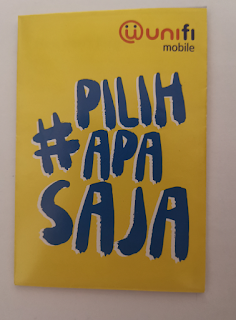 There is no commitment to pay monthly or to periodically top-up a minimum amount, until it is fully used up, as long as you remember to keep your line active (you got plenty of SMS, just simply send out one SMS every quarter will be able to keep your line active). trying to get a free beautiful new mobile number. planning to use it for tablet that connects to WiFi most of the time. planning to use it for secondary phone with low usage. planning to use it for mainly receive calls and/or SMS. an elderly person who most of the time stays at home with Unifi broadband subscription (with WiFi, IPTV and DECT phone), so you only need to use your mobile phone when you are not at home. a person who finds that Unifi Mobile #bebas prepaid plan is able to provide flexibility and freedom to pay for your actual use, without monthly payment or periodic top-up commitment. 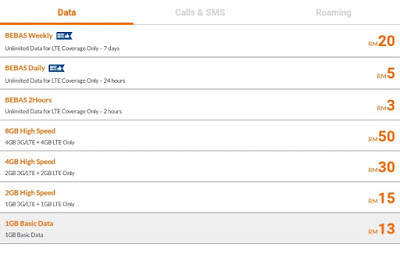 You can easily toggle on/off the IDD and roaming service of your SIM card from within the Mobile@Unifi app setting. It is advisable for you to turn OFF both IDD and roaming unless you need to use them. This is because if you use them (either intentionally or accidentally) without prior subscription to an IDD and/or roaming pass, you will be charged on Pay As You Use (PAYU) basis which could burn your wallet a big hole. The rate of IDD and roaming pass in Unifi Mobile is on par with most other postpaid/prepaid plans, not so attractive either. The IDD and roaming pass in Yoodo has more attractive price. Unifi Mobile #bebas is having a March buy-one-free-one promo today 20 March 2019 from 10.00am until 10.00pm only. purchased once during this promotion. As for the 60 mins + 60 SMS pass, it can be purchased multiple times within the promotion period. Hint: Click on the "Older Posts" link to continue reading, or click here for a listing of all my past 3 months articles. UNIQUE READERS from top 64 regions since 1-Jun-2008.